Posted June 18, 2015 by Emily Contador-Kelsall & filed under City Hub, City News. 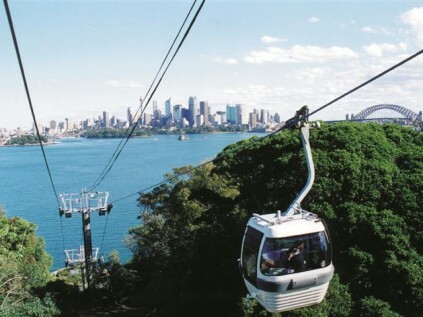 Locals have criticised the proposal for a cable car system across Sydney Harbour as an ineffective plan to ease traffic in the Bays Precinct and city. The proposed 3.4 kilometre cable system would transport commuters to stations at Rozelle Bay, White Bay Power Station, White Bay cruise terminal, Pyrmont and Barangaroo in under five minutes. Plans for Harbour Skylink have won over cruise line Carnival Australia and The Star casino owner Echo Entertainment, who backed the Sydney Business Chamber and Committee for Sydney’s call for the state government to consider the proposal. A Transport for NSW (TfNSW) spokesperson told City Hub that it understood the concept was in its early stages and it would need to prove itself. “The proponents of the cable car would need to demonstrate its feasibility and benefits including potential reduction of road congestion,” the spokesperson said. But many locals have argued the proposal does not have the capacity to transport large amounts of people travelling on the route. Instead, they believe it serves to benefit the tourism and gambling industries, leaving the Bays Precinct and city areas at gridlock. EcoTransit Co-Convenor Gavin Gatenby said the cable cars have a very low capacity limit. “Around the world they are little more than tourist attractions… as serious public transport infrastructure, they’re a joke,” Mr Gatenby said. Echo Entertainment will consider placing the Pyrmont stop on top of The Star, which would link it to the proposed casino at Barangaroo. NewsCorp media reported that an Echo Entertainment spokesperson said “any iniative that could contribute to improving connectivity to and around such an important precinct is worth looking at”. But state member for Sydney, Alex Greenwich questioned the effectiveness of the proposed cable car system. “I’ve been pushing for better public transport for the Ultimo and Pyrmont peninsula, which has had massive population increases, but the cable car proposal does not seem to help commuters,” he said. Elizabeth Elenius, convenor of the Pyrmont Action group said she believed the way to fix the issue of congestion would be to have a ferry hub in the area. “[The cable cars] appear to be a transport proposal that would benefit the tourism and gambling industry, with no benefit for the people who live and work around the Bays Precinct. A Bays ferry service, planned in consultation with the community, would be far more practical and visually acceptable,” Ms Elenius said. EcoTransit has previously proposed the White Bay Green Link plan to construct a light rail for the area linking the Dulwich Hill line with the Rozelle Bay stop and connecting it to the city, covering all the proposed locations. “[The plan is] to get serious commuters directly from the inner west to Balmain and Barangaroo in the shortest possible time. And to do that you really need to have a fast light rail link going underneath Darling Harbour.” Mr Gatenby said. “Now that’s a serious people mover”.